I'll be honest, the only thing I can remember about the 2009 G.I. Joe: The Rise of Cobra is that it wasn't good. Still, I decided to give this sequel a chance: I thought that, if nothing else, at least the 3D should be good. And it was - I saw the IMAX 3D version and visually it was almost too much. I also thought this film was a vast improvement from the first one. Action-packed and occasionally funny, G.I. Joe: Retaliation is not the worst example of a popcorn flick. First, let me mention the visuals. The 3D is getting better and better these days (and doesn't give me a headache anymore): there is a balance between dodging things flying out of the screen and simply dimensional experience. While you will definitely notice the 3D, you won't have motion sickness after 30 minutes. As for the action sequences themselves - they were really great for the most part. There were a few moments where I felt like I was losing the sense of what was happening because so many things were flashing before my eyes, but the majority of action was beautifully done. Ninja fights anyone? The acting is really not the point of a movie such as this one. Not to say it was bad - to be honest, it's much better than it was in G.I. Joe: The Rise of Cobra. No character made me think "this guy is just ridiculous" and the chemistry, for the most part, was quite good. 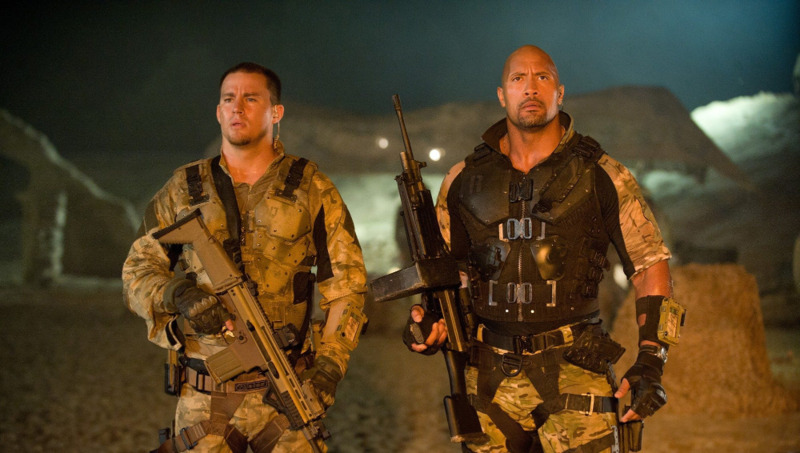 Dwayne Johnson is perfect as Roadblock and his relationship with Duke (Channing Tatum) is one of the best parts of the movie. Jonathan Pryce holds his own as the President and Bruce Willis... well... he's Bruce Willis! When he appeared on the screen, I relaxed because I knew it was all going to be good now - saving the day is his specialty. The occasional humor is rather enjoyable as well and serves as a good break from all of the action and plotting. Of course, it wasn't all fun and games and I did have some issues with this film. I'm going to list them as questions and, if anyone knows the answers to these, please share your knowledge with me. I suspect most of them can be answered by watching the first movies again and familiarizing myself with the comics, but we all know neither of those is going to happen. 1. Why the subplot overload? OK, I'm usually a fan of characters having backstories and all that, but I felt like I needed a pocket guide here. I'm pretty sure I still missed half of the connections and relationships. Also, I felt like some of them had nothing to do with the main storyline, so it felt like random trivia to me. 2. What was the point of Channing Tatum in this movie? No, really, why was he even there? 3. Do Roadblock's kids have a mother? Seems like they're home alone a lot and even Channing Tatum doesn't want to babysit them. Also, Roadblock never mentions his family or missing them. Are they even his? Why are they there? 4. Why, of all people, would you underuse Bruce Willis? Granted, even with the little screen time he had, he managed to steal the show. But why not put an action star to good use? 5. Was there some relationship between General Joe Colton and Lady Jaye that I missed? At one point I thought he was her father, but I'm clearly way off on that one. Why did he keep calling her Brenda? 6. Where were half the characters from the first movie? Instead of all the random subplots, it would have actually been good to know what happened to them. Did they all drop dead? Did they give up and retire on a tropical island? Are they drinking their sorrows away in Vegas? As a final thought, I did somehow enjoy G.I. Joe: Retaliation. Not to the point of actually loving it, but still, I didn't hate it either. As an action movie, it's alright, even though with all the guns and explosions the plot still seems childish. Maybe it's the fact that the villain wants to rule the world for no apparent reason. Maybe it's the fact that I can't take that many nicknames seriously. Either way, this sequel is fun if you're in the mood for it and have no expectations whatsoever. I'd be curious to know if it plays any different without the 3D. What do you guys think?